Protect your colour with a shampoo and conditioner from Joico, Nexxus and Be.Better! 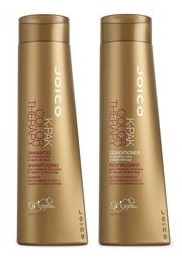 Joico K-Pak Color Therapy Shampoo & Conditioner - 300ml - $12.69/$14.99 - preserves colour and repairs damage thanks to a bio-advanced peptide complex that offers longer-lasting reconstruction and increased strength and elasticity to balance hair and give it a soft, shiny and supple feel for hair that is dramatically stronger and healthier even after just one use. Available at fine spas and salons across Canada. Nexxus Color Assure Vibrancy Retention Shampoo & Conditioner - 400ml - $9.46/$13.96 - with exotic white orchid that helps seal and protect the hair cuticle to prevent colour from seeping out for long lasting luminous colour that keeps hair looking remarkably vibrant. 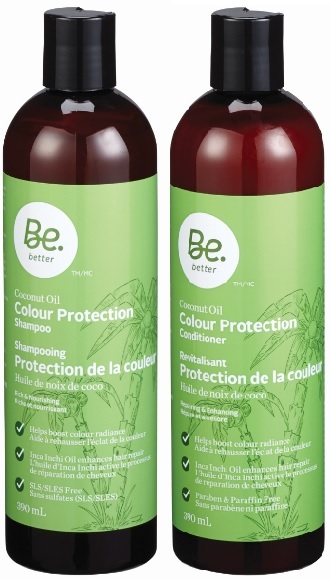 Be.Better Coconut Oil Colour Protection Shampoo & Conditioner - 390ml -$9.99 -the shampoo combines nourishing coconut oil with organic Peruvian inca inchi oil to repair damaged hair and horseradish tree oil for UV protection - to leave hair full-bodied and vibrant; while the conditioner combines nourishing coconut oil with organic Peruvian incha inchi oil to repair damaged hair along with grapeseed, jojoba and sesame oils for intense hydration. works instantly to detangle and help repair colour-treated hair leaving it light, silky and vibrant. Available exclusively at Rexall stores across Canada.